Maana, a pioneer of digital knowledge technology, announced today at CERAWeek a collaboration with Microsoft’s Manufacturing and Resources Industry division to help oil and gas industry companies accelerate their digital transformation. The collaboration integrates Maana’s Knowledge Platform™ with Microsoft Azure and makes Azure services and tools available to all Maana customers and application developers. Integrated Azure services to accelerate development and deployment of models. "It takes a variety of data types, algorithms, and subject matter expertise to optimally solve today's most critical industrial and business challenges,” said Donald Thompson, CTO and Founder of Maana. 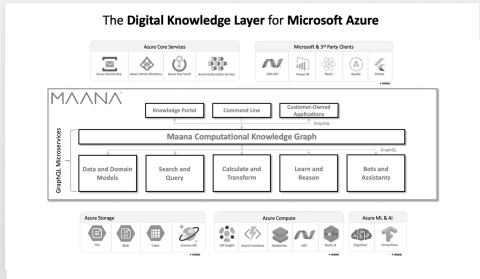 “With deep Microsoft Azure collaboration, Maana extends its Knowledge Models, Services, Bots, and Assistants to more data sources and advanced ML/AI services." To learn more about Maana and their partnership with Microsoft, visit www.maana.io. Maana organizes the world’s industrial data and human expertise into digital knowledge to enable millions of experts to make better decisions affecting global economy and human civilization. Using our Knowledge Platform™ and its proprietary Computational Knowledge Graph™, Fortune Global 500 industrial companies drive answers to operational questions that direct the future. Operating internationally, Maana is a privately-held company with offices in Menlo Park, California; Bellevue, Washington; Houston; London; and Dhahran, Saudi Arabia. To learn more about Maana and our Knowledge Platform™, visit www.maana.io.